Two cars from the Baikalplan e. V. started off for Irkutsk via Finland in Mid June 2003. 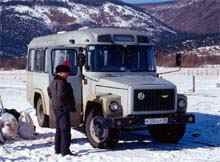 Meanwhile it was relatively uncomplicated to drive to Siberia at the time. But you should always keep at the back of your mind that the roads won't always meet your requirements, that the Siberian plain with its never-ending forests of birches will loose its fascination after a couple of days, AND you should be aware of the smelly socks of the three guys you are travelling with and who thinks, they don't need to take a shower because this is pure nature  they actually might intend to anaesthetize you :-)! Well, no real problems. For safety reasons, we advise never to drive at nighttime! Plan to be at one of the numerous roadhouses (avtostojanka) at nightfall. Here you can leave your car without having nightmares. Raids on the road at night and "payable" controls of the road police (GAI  Gosudarstvenaja Avtomobilnaja Inspektsia) are still common. Less complicated nowadays is the search for gas stations. While in the past the desperate struggle to find any supply of fuel revealed the evil site of your personality, the modern network of gas stations established by companies like Lukoil or Yukos will conjure a bright smile on your face. Like in Europe there are also independent gas stations waiting for you in the middle of nowhere which just consist of a petrol pump disguised by some boards of wood. They mostly just have one kind of petrol, hence sold at a low price. Admittedly these gas stations contaminate the whole soil of the surrounding area and therefore should be avoided. By the way, it is customary to pay the amount of fuel you wanna get beforehand. Otherwise you'll face no problem if you overestimated your amount of fuel needed. You'll be payed back any single rouble you payed extra! At the moment, petrol is reasonably priced, one litre costs appr. 16 roubles (as due to summer 2005), depending on the octane number. Maybe it's also worth mentioning that it's better to go for gas with higher octane numbers than you would normally use in your home countries, for its quality might be not the one you are used to.